Welcome to the final Let's Bee Social for 2014! This year has been a blast! I have so enjoyed meeting new friends and becoming better acquainted with all of you. I look forward to the New Year and all the exciting possibilities that lay ahead. 2015 is going to be awesome! Fox & Friends 1 and Fox & Friends 2. And there will be a Fox & Friends 3! This Custom Order Baby Boy quilt. And my final finish, this WoW-E! baby quilt. The EU is bringing new VAT legislation into effect as of January 1st, 2015. You can read more about what I am using as a solution to this problem in this post. As of tonight, I will be closing my Craftsy Pattern Store. Until then, all my patterns have been reduced to $3.00 or less. Please visit my NEW pattern shop for instant download pdf patterns. PS. A note for those who took the time to email me or left encouraging comments on my blog post about the VAT legislation that is effecting all digital file sales to the EU.... Thank you so much! 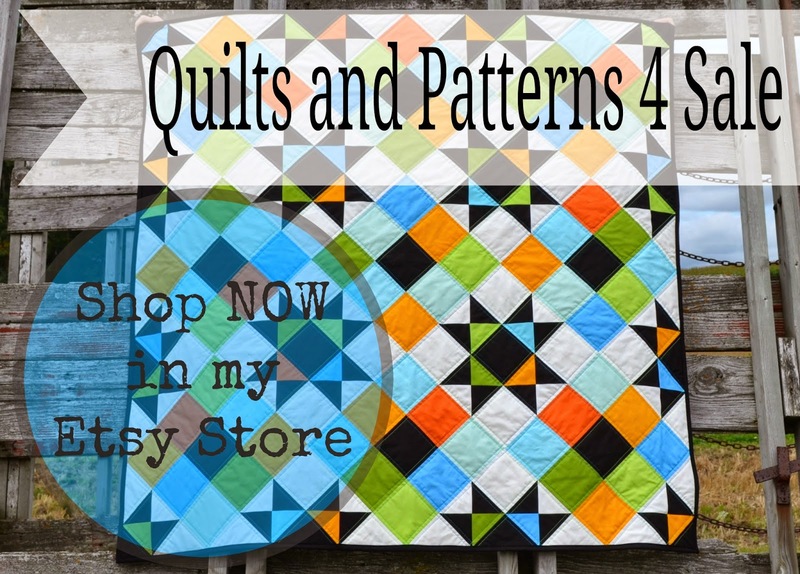 And for those of you who took advantage of my sale on patterns that had been previously been listed in my Craftsy Pattern Shop.... Thank you ALL so very much! For those who took the time to visit my NEW Pattern Store.... YOU are a treasured friend. I truly appreciate your support! 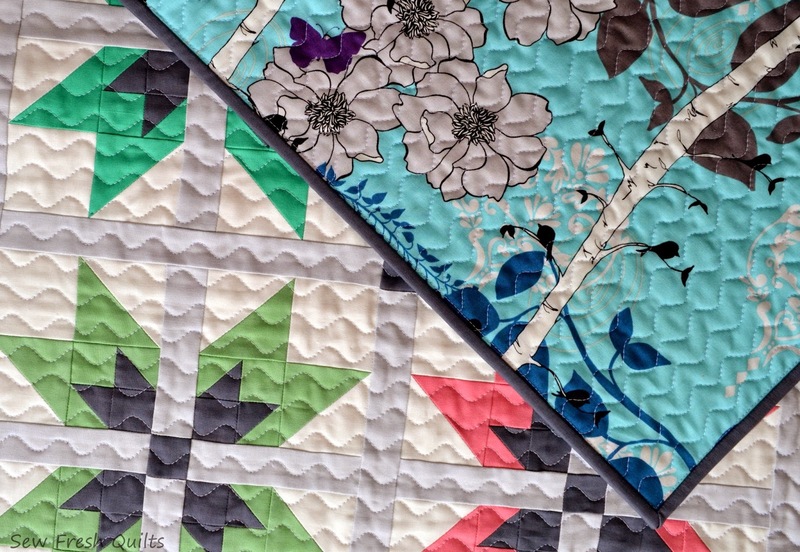 Keep On Quilting On, my friends! Any reason to have a pattern sale is a good reason! Or is it? You may or may not be aware, the EU is bringing new VAT legislation into effect as of January 1st, 2015. This legislation states that everybody selling digital products (such as pdf quilting patterns) to anybody in the EU must charge VAT (value added tax) at the rate of the country that they are selling to. It would then be my responsibility to follow through with paying those taxes through an expensive, time consuming tax policy process. Ain't nobody got time for that, girlfriend. 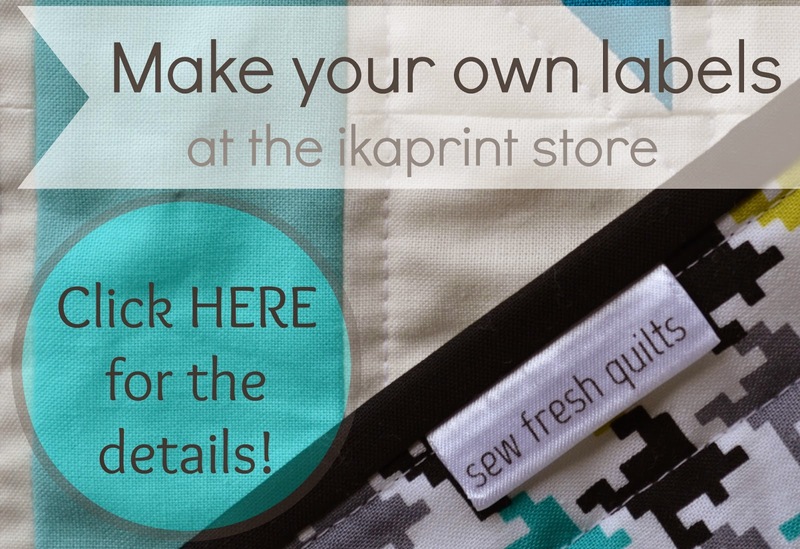 As of January 1st, I will be closing my Craftsy Pattern Store. Until then, all my patterns have been reduced to $3.00 or less. However, although my patterns will remain for sale in my Etsy Shop, in order to control what countries my PDF sales are available in, they will no longer be for instant download. As a solution, I am moving my patterns onto a different platform called payhip.com and I have opened a NEW Store. 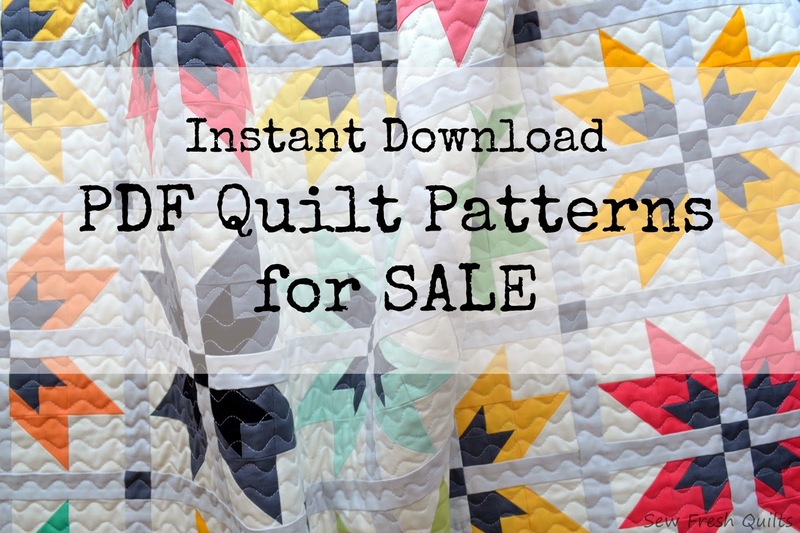 If you look at the top of my blog, you will see a new tab called "PDF Quilt Patterns for Sale". This is where you will now be able to buy my patterns. These patterns are for instant download, no matter what country you are from, and are VAT compliant. Please check out this post for the details. Thanks so much for taking the time to read this post! If you have any questions, feel free to comment or send me an email. Hello! My name is Lorna. 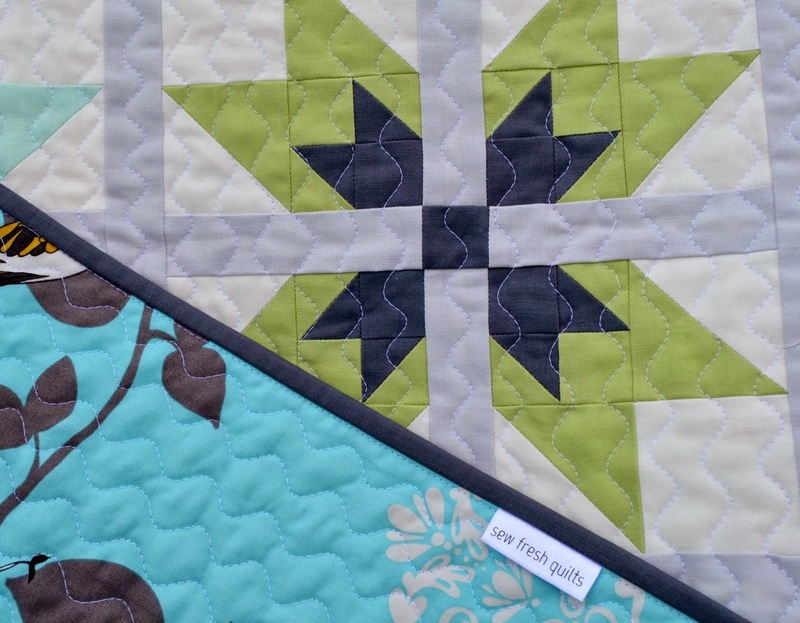 And Sew Fresh Quilts is hosting this week's TGIFF! The final TGIFF for 2014! Today I am sharing my WoW-E! quilt finish. 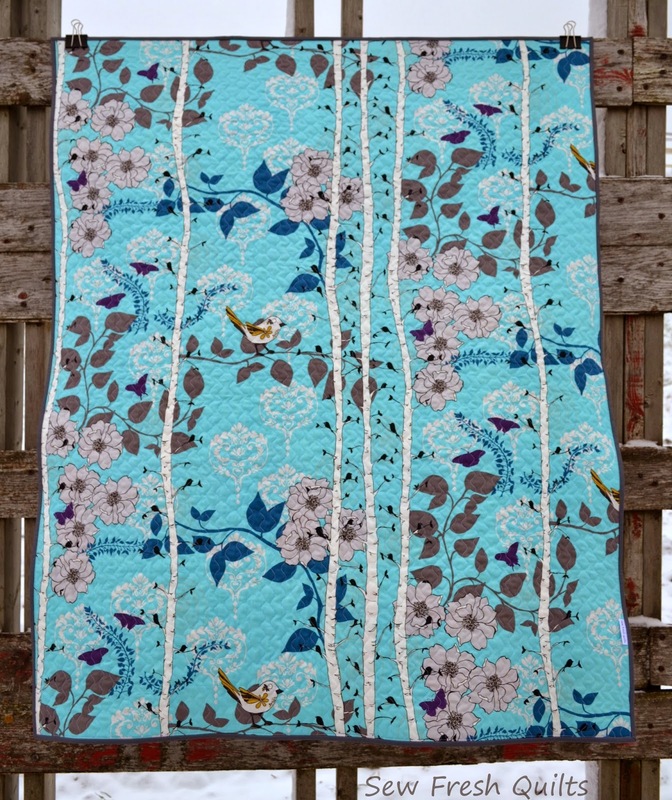 It was a bit windy when I took this quilt out for photographing. 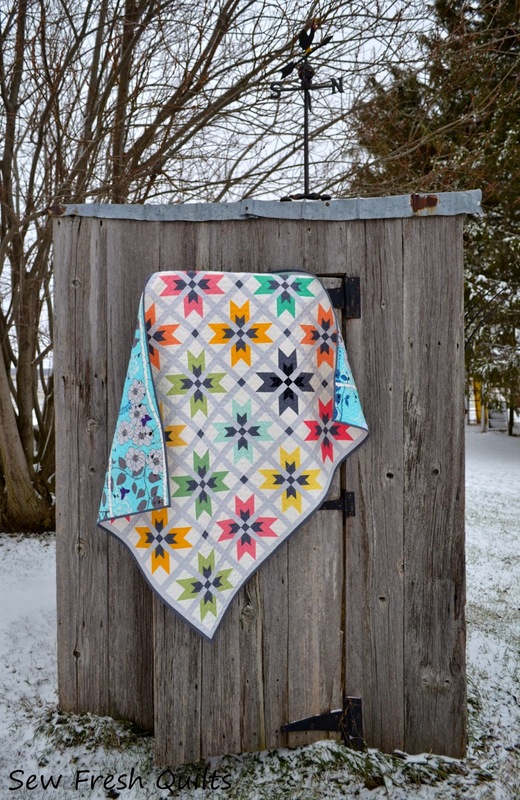 So after my fingers got cold waiting for the breeze to settle, I tried out a new shoot location and hung this quilt on the well house door. 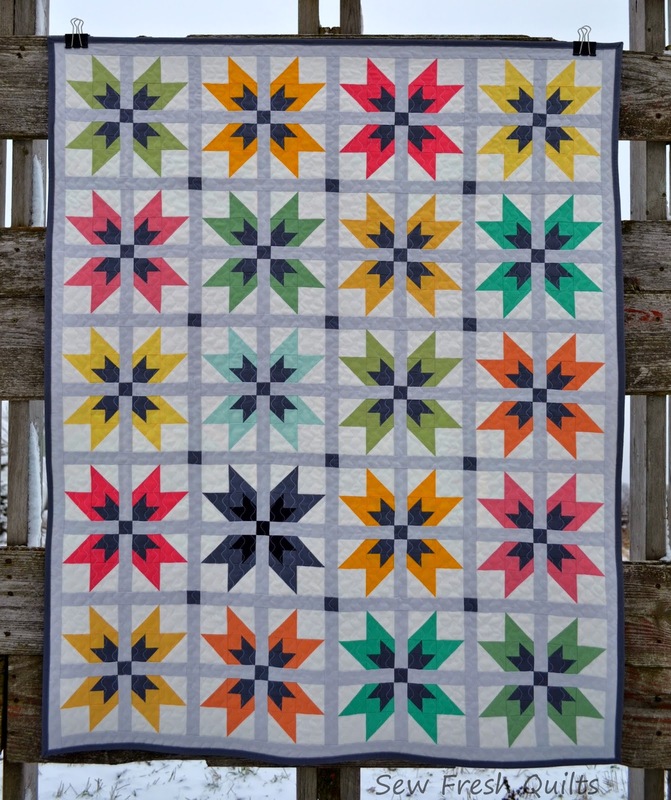 Last week we were fresh out of snow when I photographed the custom quilt. But now we have a little sprinkling. Not a completely green Christmas! I have to admit.... when I had the blocks completed.... and put them up on the design wall.... I had my doubts about the colour choices I had made. They looked great together as a pile of fat quarters. But to me, the blocks looked bland and boring. The addition of the Silver sashing and Coal cornerstones changed everything. They brought all those colours into line and set each block apart so perfectly. Now I just love it! When I shared in Tuesday's post that the top was finished, I had no idea what I was going to use for the backing. Of course my son Russell was called into the sewing room to give his opinion on the two pieces pulled for the audition. He always has the best advice. So honest and with the eye of an artist. He enthusiastically said he "really liked" this one. It is Novella Finnelopy in Aqua by Valori Wells for Free Spirit. I did not want to go with something too plain. The blocks are made from some pretty subdued Kona cottons. Some of their names remind of summer: Melon, Punch, Lemon, Daffodil, Green Tea, Asparagus, Sunny, Mango, and Cypress. The Ice Frappe may be something to drink in summer, but the name makes me think of winter. As does the Snow, used for the background and the Silver used for the sashing. Coal was used in the block centers and for the binding. Hope none of you ended up with this in your stocking!!!! Unless it's Kona Coal of course! These individual blocks finish at 9" square. And the quilt finished at approximately 41" x 51". Making a nice sized baby or lap quilt. But the WoW-E! 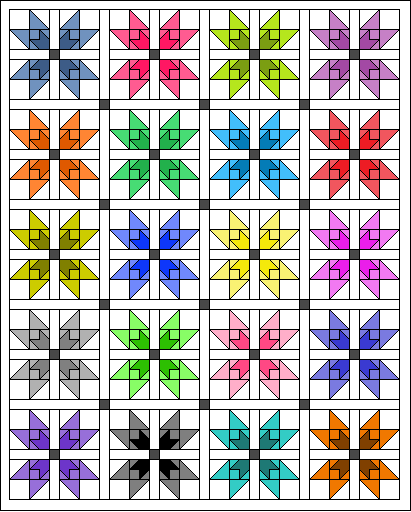 pattern, has instructions for THREE DIFFERENT sizes. It is now available from my little Etsy shop here! Thanks so much for supporting TGIFF! 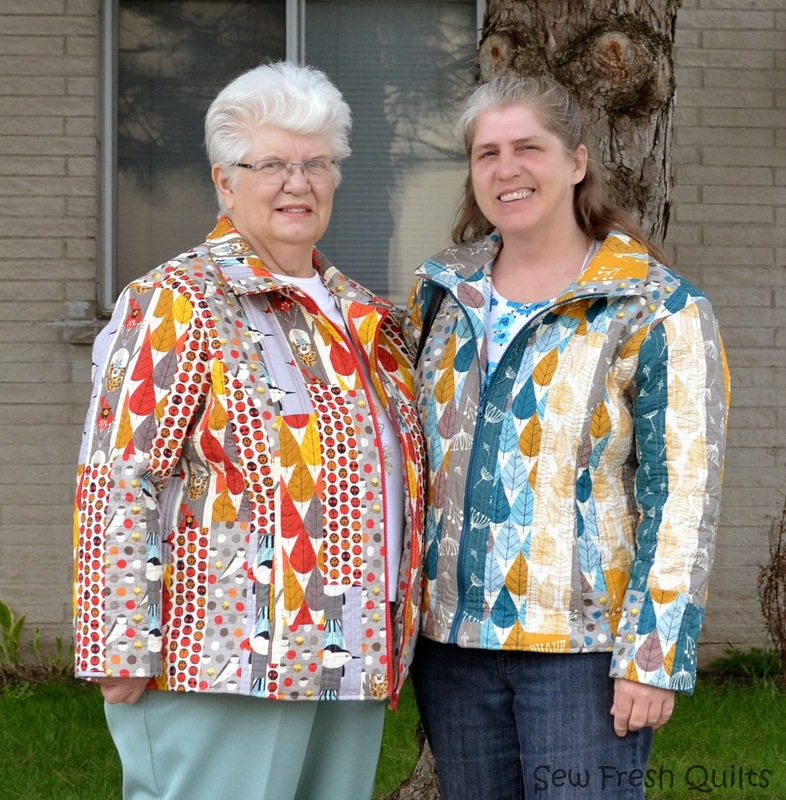 Also linking up to Finish it up Friday with Amanda Jean of Crazy Mom Quilts. Labels: Friday Finish, Quilt pattern, quilt pattern for sale, serpentine, stitch, TGIFF, WoW-E! Welcome to the 52nd Let's Bee Social for 2014! I would like to take a moment to reflect back on this wonderful year. There have been a lot of GOOD FRIENDS made this year, too! Thank you all for your kindness, your thoughtfulness, your willingness to share, your sweet compliments and your witty comments. 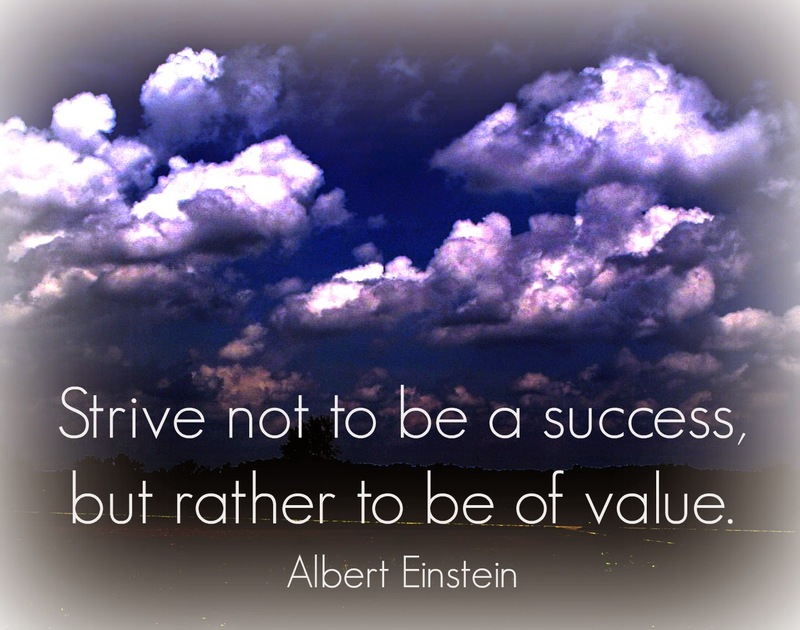 You are the reason I will continue to "strive to be of value", as outlined in this post. It has been a complete year since the Let's Bee Social weekly linky party began. And thanks to all of you, my friends, for making it a success. 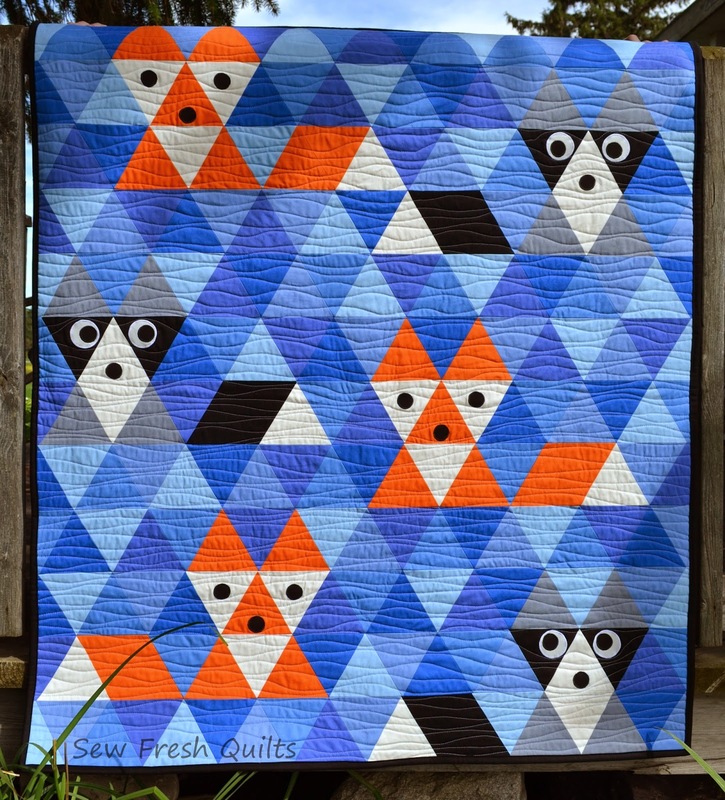 Last week I mentioned that Sew Fresh Quilts was celebrating it's 2nd Blogiversary. How appropriate that the traditional gift for a second anniversary is COTTON! 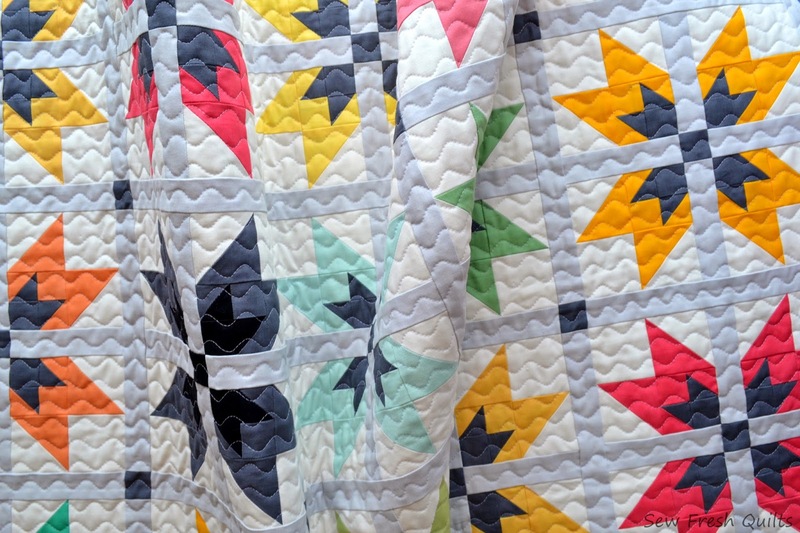 To help me celebrate our 2nd Blogiversary, Fabric Spot generously donated a $25 Gift Certificate to give away to one lucky follower of the Sew Fresh Quilts blog. Thank you all so much for your continuing support of the Let's Bee Social. It is a pleasure to meet new friends each week. And to revisit my old friends, too! It's a finished top and I adore it! The blocks were made using Kona Cotton Solids in Melon, Punch, Lemon, Daffodil, Green Tea, Asparagus, Sunny, Mango, Cypress, Ice Frappe, Coal, Black. Snow for the background and Silver for the sashing. Coal will be used for the binding, but I am still not sure what the backing will be. Yet. I did consider this layout using blocks with a two tone quality. And white sashing. The individual blocks finish at 9" square. And the quilt top finished at approximately 41" x 52". 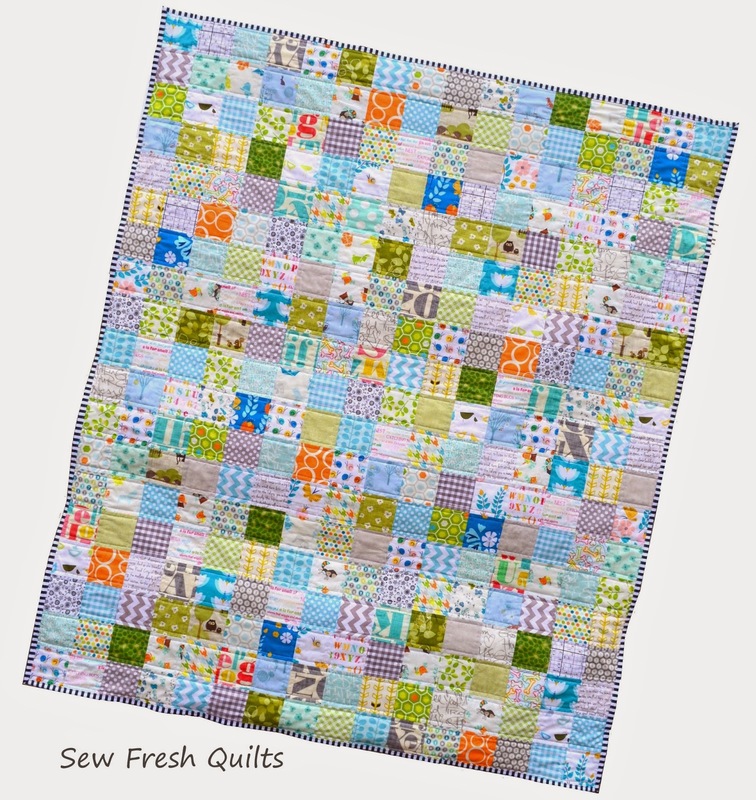 Making a nice sized baby or lap quilt. The WoW-E! blocks can also be made in a 13.5" block and 20 blocks would finish at approximately 61.5" x 78". Or in 18" square blocks with 20 blocks in this same layout finishing at 82" x 104". 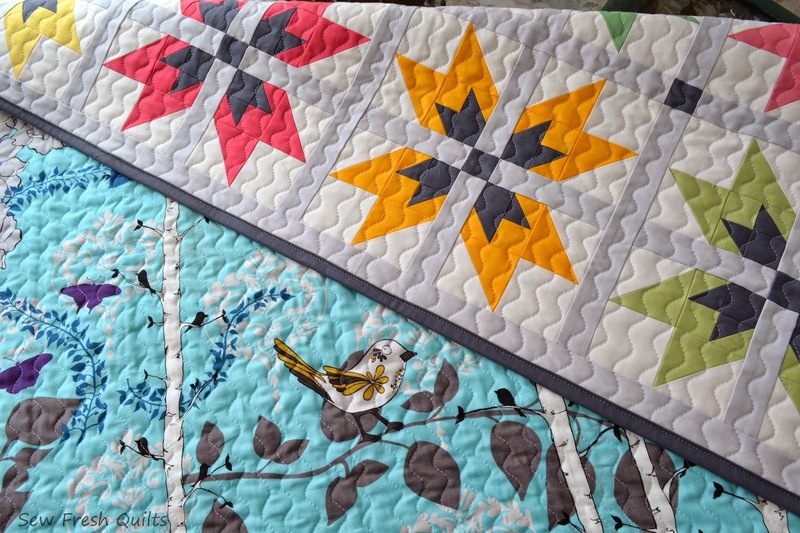 Adding more blocks or larger borders can help you to adjust your quilt to the desired size. The WoW-E! pattern, which has instructions for all three sizes, is now available from both my Payhip pattern store here and in my little Etsy shop here! And TGIFF! hosted this Friday with ME! PS. Don't miss out on this month's GIVEAWAY. It's a 2nd Blogiversary Celebration! Labels: Craftsy, Etsy, finished, Kona cotton solids, quilt block, Quilt pattern, quilt pattern for sale, WoW-E! My daughter, for some reason, has a thing for squirrels. I mean how can you resist? They are just so cute! If you agree.... then you can't blame me when I splurged and bought these lovely little pieces on impulse. Remember when I grabbed these during this shopping trip back a few weeks ago? From the Norwegian Woods collection: Acornucopia, Hedgehoglets in Teal, and Two Nuts For Dinner in Multi. I had a few pillow forms in my stash. They were picked up last year during a 50% off sale. And I thought it was high time I used a few of them up. At first I considered making quilted cushion covers. But I just couldn't bring myself to sewing across these adorable animals. So I cut my pieces exactly the same size as the pillows, cut pieces for backing in the same sizes, and then overcast stitched the edges on all sides. A hidden zipper looks so much more finished. But this panel print wouldn't allow for that method here. So I just added the zipper to the bottom of the pieces, like so. Stitched that zipper into place on one piece. Then lined up the second piece on top, matching up the corner to know where to start the other side of the zipper. I made two BIG pillows for my kids last year here. And did use the hidden zipper on one of those. These three little pillows were made in one day. Finishing up just in time, as the kids came home from their last day of school for 2014. Let the holidays begin! It was such a pleasure to sit and sew the day away. And end up with these three fast finishes. Maybe I should schedule a few more play days for next year?!!! Wishing you all the very Merriest Christmas! 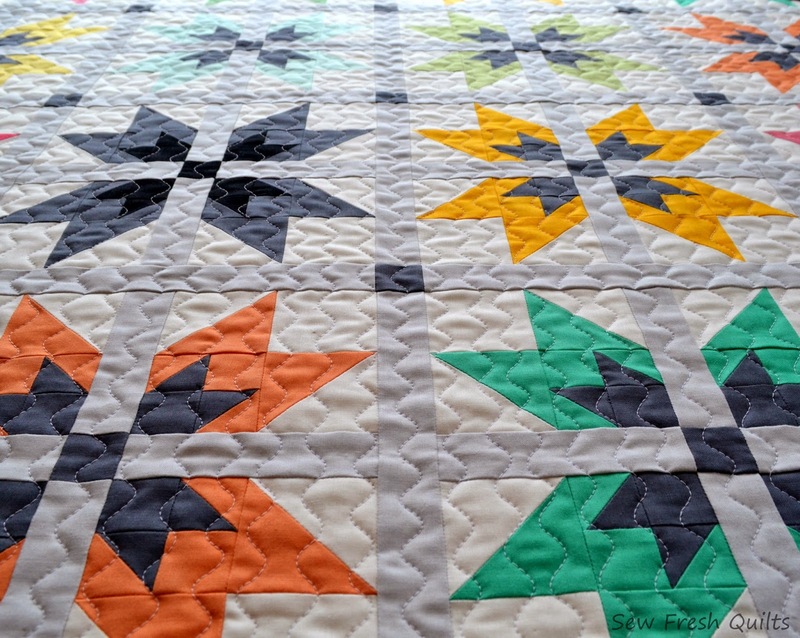 Half Square Triangles: Love Em or Hate Em?